Since Malaysian authorities identified the nerve agent VX as the cause of death in the assassination of Kim Jong Nam, the half-brother of North Korean's Kim Jong Un, concerns have been raised over the state's chemical weapons capabilities. Earlier this month in parliament, Japanese Prime Minister Shinzo Abe raised the possibility of North Korean sarin-tipped missiles. So what are North Korea's capabilities? Unlike its missile and nuclear programs, which North Korean leaders proudly parade and test, Pyongyang denies it possesses chemical weapons. North Korea is not a state party to the Chemical Weapons Convention (CWC), which bans the production, possession and use of chemical weapons. It therefore has never had to declare its facilities, nor had inspectors on the ground. Consequently, what little public information there is available on potential North Korean capabilities and stocks is predominantly reliant on testimonials from North Korean defectors, reports by intelligence agencies and the occasional sound bite from government officials. According to an oft-cited 2009 report by International Crisis Group (ICG), North Korea established a chemical department in the Ministry of Defence in 1954. The initial focus was on developing a defensive capability (such as gas masks and antidotes), until an offensive program could be established. In 1961, Kim Il Sung issued a 'chemicalisation' declaration to establish an independent chemical industry with dual civilian and military uses and in 1980 reportedly told the Central Military Committee of the Korean Worker's Party that it would be 'effective to produce poison gas and germ weapons for use in combat'. Whether Pyongyang already had the ability to independently produce chemical weapons by then depends on the source. As discussed in the ICG report, some South Korean and American estimates agree that China and the Soviet Union transferred training and technical information in the 1960s, some of it potentially originating from Imperial Japan's program in Manchuria. One South Korean report also suggested the Soviets provided small amounts of mustard and nerve agents to Pyongyang in 1966, while a former DPRK military attaché in Berlin reportedly acquired 'technical know-how' from the East German government in the late 1970s. A report from the US Defense Intelligence Agency (DIA) in the early 1990s stated the North had acquired defensive chemical weapons capabilities by 1979 and then moved on to develop an offensive program. 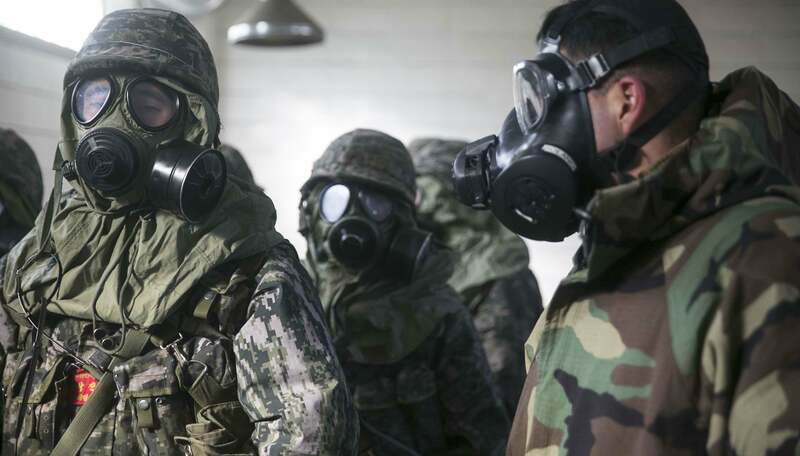 In January 1987, South Korea's Minister of Defence Lee Ki Baek told the Korea Herald that the North had stockpiled 180-250 metric tonnes of chemical weapons, including mustard and nerve agents. The inventory was suspected to be the same two years later. By 1992, estimates jumped dramatically when the South Korean Agency for National Security Planning (now the National Intelligence Service) claimed there were six chemical weapons storage centres in North Korea containing close to 1000 tonnes of material each, some of which was kept in artillery pieces. It also claimed that the North had the capacity to produce another 5500 tonnes annually (plus 2200 pounds of biological weapons). Since the mid-1990s estimates have been steady and invariable, putting the stockpile at between 2500 and 5000 metric tonnes, with accounts from defectors leaning towards the higher end. Maximum capacity is cited at 12,000 tonnes. Nerve, choking, blood and blister agents are all suspected to be part of North Korea's chemical weapons program. It has also been noted there had been no public indications that DPRK produces binary chemical agents until the VX allegations in February. Since Jane's Defence Weekly quoted a Western source in January 1989 that North Korea had assembled the world's third-largest chemical weapons arsenal (after the Soviet Union and US), the ranking has stuck. The claim was alarming, suggesting a growing program, but the 1980s estimate of a couple hundred tonnes would not have placed North Korea even in the top five of the world's largest possessors. After ratifying the Chemical Weapons Convention (CWC), Moscow declared 39,967 metric tonnes of chemical weapons and Washington 28,577 tonnes to the Organisation for the Prohibition of Chemical Weapons (OPCW). To this end, it is just as difficult to find any information publicly available about South Korea's program, estimated at 3126 metric tonnes. It likely began around the same time as North Korea's. Throughout the 1980s, the US suspected South Korea of having a chemical weapons program and regularly listed ROK in its annual intelligence assessments on the proliferation of weapons of mass destruction, although these reports were (and remain) heavily redacted. In recognising the 2008 milestone, the US Ambassador to the OPCW Eric Javits stated that 'quietly and without the public recognition it rightly deserves, a State Party completed the destruction of its entire chemical weapons stockpile becoming the second State Party to do so, and before its deadline'. As Russia, the US and other countries dismantle aspects of their chemical weapons programs, North Korea's ranking goes up. But the precise figures are unknown, as is much of the North's capabilities, including its delivery systems. In light of Malaysian authorities claiming VX was the cause of Kim Jong Nam's death along with heightened tensions surrounding DPRK's nuclear and missile program, there is an urgent need for international investigation. Surprisingly, Malaysian authorities have not shared samples with the OPCW. Without third-party confirmation it is difficult to know whether it was in fact a demonstration of the North's chemical weapons capabilities or even if it was VX. Unlike Syria, where the OPCW has been able to confirm the use of chemical weapons, the case of chemical assassination remains unnecessarily mysterious. On 29 April 2017*, the world will commemorate 20th anniversary of the Chemical Weapons Convention. By now, the standard practice should be one of transparency and international due process. * The date has been corrected; this was an editorial error.